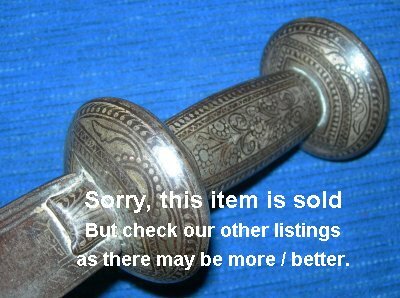 A very rare fine, dress, Nepalese kora with koftgari hilt, in mostly good to very good condition. Now with 20% discount. A very good and exceptionally rare Nepalese dress kora, possibly used for sacrificial animal ceremonies. 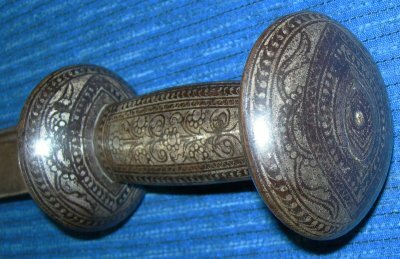 The stunning koftgari work hilt is still mostly vivid, though worn one side of the grip. The 19 inch blade is very well made and firm in the hilt. I suspect this kora was worn by a merchant or other important citizen; the sword is quite hefty for such a small sword and I suspect it was designed that way, to be able to effect a nasty blow if required, as well as look good and boost the status of the wearer. A great find and buy at £? (too late, now sold). Further / full-sized pictures available upon request. Please quote item reference number C55 (640).